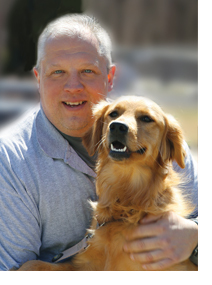 The staff at Delaware Valley Golden Retriever is dedicated to rescuing and rehoming DVGRR dogs with the utmost standards recognized in the industry. That’s why, in 2012, we were named Purina Shelter of the Year. Moreover, it’s why over 4,500 dogs have gone through Golden Gateway with extraordinary care and preparation to ease the transition into their new forever homes. Your support has made each dog’s journey possible. Prior to joining the staff at DVGRR, I spent 16 years as a partner/operator with my father and brother in the family soft pretzel and Italian ice franchise businesses. Before that, I spent eight years as a computer programmer analyst for Meridian Bancorp. I graduated from Lebanon Valley College in 1988 with a BS in Computer Information systems and a minor in Business Management. My involvement with DVGRR began in 1994 as a volunteer after adopting Toby. From 1994 through 2005, I kept busy as a volunteer, helping at events and serving on the Golden Gateway acquisition committee. In 2006, I was asked to join the Board, on which I served until November 2013, the last four years as Board Chair. Prior to becoming Executive Director, I was the Facility Operations and Staff Support Manager, responsible for the human resources aspect of the organization as well as maintenance of the facility buildings and managing current and future campus building expansions. I can honestly say that I am continually amazed at the growth the organization has undergone over the past 20+ years from a foster home-based rescue to a campus with seven facility buildings covering over five acres. This is a true testament to the unbelievable generosity of DVGRR’s donors and volunteers and their belief in our mission. I look forward to working with the incredible Leadership Team and staff to continue to provide the best possible care and rehabilitation for the Goldens and dogs with “hearts of gold” in our program and enable them to find their “fur-ever” homes as well as continuing to build on the prior achievements of DVGRR and pursue exciting new opportunities. My family includes my wife, Mary, and sons, Tony and Adam, and our DVGRR dogs, Lambeau, Nittany, Bacardi, and Hunter. Our other animal family members include a cat, rabbit, two cockatiels, two guinea pigs, and three African dwarf frogs. Next to my family and dogs, my greatest love in life is the game of football, and I am an avid fan of the Green Bay Packers, Penn State, and my alma mater, Lebanon Valley College. When I’m not at DVGRR, I enjoy spending time with my boys as well as attending their musical and athletic events. I joined the DVGRR staff in 2008 after working part-time in the accounting department of a printing company for six years. Prior to having kids, I spent 13 years as a flight attendant for US Airways. At DVGRR, I began assisting with bookkeeping functions but was soon given added responsibilities, including building our retail store and expanding the webstore to include more items for all dog lovers. Over the years, I also became our Volunteer and Events Manager. Managing the Golden Gala event each year is my favorite responsibility. Seeing all the guests having a great time and hearing all the updates on their adopted DVGRR dogs makes it all worthwhile. I am now a member of the DVGRR Leadership Team as our Development and Donor Engagement Manager. Anytime I can communicate with our adopters, donors, and volunteers to listen to their stories and ideas for DVGRR means so much to me as those interactions are the foundation of DVGRR success. My assorted responsibilities are all very rewarding, but my greatest sense of satisfaction comes from seeing the happy faces of both the dogs and adopters when one of our dogs leaves to go home. I love interacting with all the dogs! My family includes my husband, Bill, and my children, Kurt and Paige, and our DVGRR Golden, Sammy. When I’m not working at DVGRR, I love to volunteer as a Girl Scout troop leader and spend time with my kids just being their mom. Before coming to work for DVGRR in August 2006, I was very involved in the music world. I earned my bachelor’s degree in music from Lebanon Valley College, worked in a music store, played in several rock bands, and was a live sound engineer. At DVGRR, I work directly with the dogs in The Lynne Glennon Sanctuary for Senior Goldens and Puppy Mill Survivors and also live on the premises. I am responsible for ensuring that any dogs who need assistance overnight will receive it; this usually happens during thunderstorms if there are thunder-reactive dogs in the kennel. I truly enjoy seeing and helping the dogs in our program improve while they are with us. I love seeing shy dogs becoming more playful, the fearful dogs learning to trust, the anxious dogs getting more relaxed, the jumpy dogs redirecting their energy more appropriately, etc. 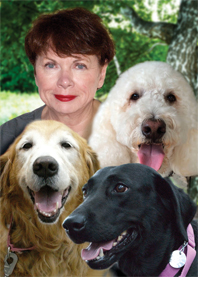 I have a special interest in puppy mill breeder dogs and am proud of my role in helping to develop and manage our Project Home Life program, a transitional step between kennel life and life in an adoptive home. 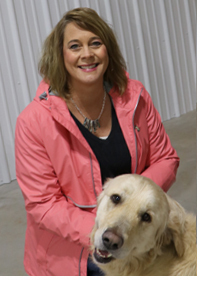 This program gives me the opportunity to help our volunteers and adopters learn how to live with and provide the necessary support and guidance to puppy mill breeder dogs. I also oversee DVGRR’s monthly Shy Dog Park, a safe place where our adopted puppy mill dogs and other shy dogs can come for play and socialization post-adoption to be around dogs that all get along well together. It’s a great place for their adopters as well since they can chat with other adopters and talk about the special needs of puppy mill survivors as well as their dog’s successes. I also monitor a Facebook group for DVGRR adopters of shy dogs and puppy mill survivors where they can share challenges and praises about their dogs. Along with other staff members at DVGRR, I give presentations about shy and fearful dogs as well as help other shelters and rescues start their own programs similar to Project Home Life. My responsibilities at DVGRR also include helping to bathe and groom all of the dogs the week before our Monthly Open House events! I currently share my home with Lance, a former hoarder dog, and Leia and Lady, both rescues from Puerto Rico. My boyfriend, Jeff, and I love hiking and snuggling with our dogs and playing music. I play keyboard in two local bands, Cloud Party and Practical Saints, playing original music as well as classic songs from the 60’s and 70’s. I was hired by DVGRR as Kennel Manager in July 2006 after previously working at a large printing company for eighteen years. At the printing company, I held several different positions: Customer Service Representative, Sales Support, and finally Customer Service Manager. Along the way, however, I kept thinking that this is not the path I wanted to take with my life. I wanted to do something with animals – particularly dogs. In order to pursue that goal, I joined what was then known as the American Boarding Kennel Association or ABKA (now known as the Pet Care Services Association, or PCSA). I spent my vacations traveling to different locations to take courses in kennel management and operations. My intent was to buy my own boarding kennel or become a manager of a boarding kennel. Rescue never entered my mind. I earned my credentials on paper but still had absolutely no hands-on experience. I noticed an ad for DVGRR and applied for a part-time caretaker job in the hopes that I could work a few evenings a week to continue my learning and get some hands-on experience to put on a resume. Then DVGRR called to inform me that the existing Kennel Manager wanted to retire in a few months and they were interested in bringing me on as manager in training; when the existing Manager left, I would step into the role. It all worked out perfectly. I will be the first to say that I was still totally unprepared for the job! Running a rescue kennel is absolutely nothing like running a boarding kennel. We’re not just housing dogs for a week or a weekend, or keeping good relations with the owners, so they keep coming back. We often deal with many health and/or behavioral challenges which means jumping from task to task every day to meet the needs of the dogs in our program, but I know we are the best place for these dogs to get what they need and ultimately to be matched with the right families. It is hard work, but after all these years, I can’t imagine doing anything else. My family includes my wife Heidi, and daughter Sophie. We have adopted three wonderful senior Goldens from DVGRR over the years but currently do not have any Goldens at home. However, that doesn’t mean we don’t have any dogs! On the contrary we have four – two Boxers and two Pugs, all are rescues. I have an extensive background in accounting and have been DVGRR’s accountant since May 2010. I handle all of the accounts receivable, including donations, adoption fees, memberships, event registrations, etc. I also help answer the phone when needed, so you may find that I am the person on the other end of the line if you call into Golden Gateway. To meet me in person, come to one of our events! I will often be found staffing the membership table at the Reunion, helping record auction sales at the Wine Dinner or Golden Gala, and taking food orders at Basket Bingo or Goldens in Paradise. When I’m not working at the rescue, I’m busy caring for my family, which includes my husband Vernon, our five children, our dog Sammi (a Border collie/red heeler mix), and our DVGRR-adopted Golden, Stryder. I stay active and healthy by jogging! Prior to being hired by DVGRR in July 2011, I worked at VCA Sinking Spring Animal Hospital for over nineteen years as Dr. Scott Krick’s assistant. 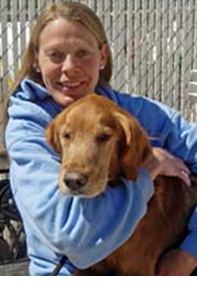 Since Dr. Krick was the veterinary advisor for DVGRR and was involved with many of the DVGRR dogs in need of medical care or surgery, I was well acquainted with rescue and knew several DVGRR staff members. When Dr. Krick left the practice, it seemed like a natural next step for me to come work at Golden Gateway. A large percentage of my first few months was spent getting ready for the opening of DVGRR’s on-site Veterinary Treatment Center, BARK (Buddy’s Animal Rescue Klinic) which saw its first canine patient in October 2011. I was involved with much of the planning for the center, ordering of equipment and supplies, and development of policies and procedures. It was a whirlwind beginning, to say the least! Now that BARK is up and running, I work closely with our veterinarian who comes in several times a week to do all initial exams, spay/neuter surgeries, dental cleanings, and other needed procedures for our Golden Gateway dogs. I schedule all the appointments, assist with each exam or surgery, perform follow up care as necessary, and provide information about each dog’s health care status to other DVGRR staff. I also oversee medication administration, ensure that all dogs are appropriately vaccinated and microchipped, and assist with several kennel shifts each week. I love seeing the dogs respond to all the great care they receive while here, and watching them change and improve as we prepare them for adoption.At home, I enjoy spending time with my husband, Jim, and caring for our four dogs, two barn cats, and assorted chickens, turkeys, and sheep. For relaxation, I am partial to kayaking and flower gardening. I recently became the Director of Adoption after serving as Assistant Kennel Manager. 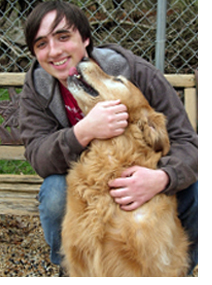 Previously, I worked part-time on the kennel staff while attending Millersville University. I’ve graduated with a degree in Marine Biology. I work with the dogs in our program awaiting adoption, helping to feed, exercise, play with and socialize them. This interaction helps me really get to know the dogs to better match them with prospective adopters. We work very hard to match the right dog with the right family based on the dogs’ temperaments and the families’ households and lifestyles. My greatest satisfaction has been working with the dogs that arrive very frightened and nervous. Sure, they may be harder to handle at first and will take longer to settle in than the average dog, but it is so gratifying to see them make progress, really “come out of their shell” and turn into great dogs. Having always had at least one dog in our home growing up, I knew I wanted a career working with animals. I have a strong passion for the ocean as well so I always saw myself as a marine biologist working in an aquarium or zoo. However when I was offered a full-time position at DVGRR, I just couldn’t turn it down. After working here part-time for many years, I fell in love working and playing with the dogs and the whole rescue organization. Currently I do not have any pets, due to renting policies, but hopefully will have a dog or two in the near future. My family includes my wife, Maddie, and son, Oliver. I enjoy hiking, camping, fishing, and reading in my free time. Ever since I was young, I have always had pets. Animals have a special place in my heart, so being hired at DVGRR has been a wonderful opportunity. I started at DVGRR in July 2013. I wouldn’t want to be anywhere else. I call it my home away from home! Prior to being hired at DVGRR, I was a pet care specialist at Petsmart Caring, and ensuring the safety of animals has been and always will be my goal. Seeing the frightened and shy dogs walk through the doors at Golden Gateway can be heartbreaking. Once here, however, it surely does not take long for them to open up and become amazing companions to us and their soon to be “fur ever” families! In my spare time, I enjoy spending time with my family and my daughter, Zoey, who also has a huge heart for dogs as well. Dogs (and horses) have long been a part of my life. In my role at DVGRR, I strive to help educate dogs and their humans, so they can exist happily together and enrich each other’s lives. I will also be working with our great volunteers to coordinate their efforts at Golden Gateway and on behalf of DVGRR. Prior to becoming a paid staff member, I have volunteered as a dog trainer for DVGRR and have spearheaded the organization’s Life Skills Class for our program dogs. In fact, I started as a DVGRR volunteer when I heard the story about the NC20 multi-dog rescue. I fell in love with them and adopted Bonnie from that group, now named Lillie. Professionally, I was a paramedic working with Western Berks Ambulance for almost 20 years. Educationally, I hold an associate’s degree in equine science and a bachelor of science degree in animal science/equibusiness, both earned at Delaware Valley College (now University) in Doylestown, PA. 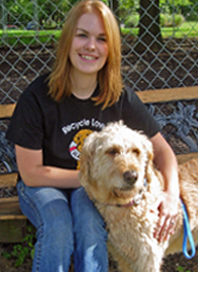 I also received certification in canine training and management from Kutztown University have attended a number of professional dog trainer’s conferences including those offered by Dr. Ian Dunbar, Kyra Sundance, Nicole Larrocco Skeehan, and Debbie Jacobs. I’ve had many Labrador Retrievers over the years, and in addition to Lillie, I have a 15-year-old Lab, Sadie, plus two horses, Jetlag and Dandee, a foster, and a cat named Goblin. 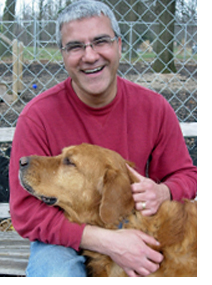 I look forward to putting my knowledge and passion to work now on a full-time basis to enable every dog at Golden Gateway to make a smooth transition into its adoptive home and to help adopters better understand what their dogs are telling them. 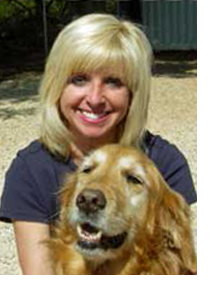 To learn about the extraordinary history of Delaware Valley Golden Retriever Rescue, visit our history page and watch our video. 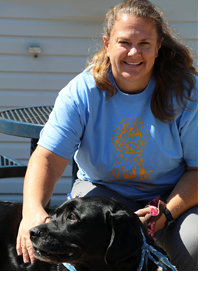 Pictured with 3 alumni, Robin founded Delaware Valley Golden Retriever Rescue in 1993. My life with Goldens began when my husband, Jim, and I purchased a Golden from what we thought was a reputable breeder. Unfortunately, however, Emerson came with many behavioral challenges. While I had cared for dogs as a child, I wasn’t prepared for the issues we were facing. Thankfully, my veterinarian suggested a behaviorist at the University of Pennsylvania, and with his guidance and consistent language, we started making good progress. Thinking that another Golden in our house might help Emerson, I answered an ad in the local newspaper for “free to a good home.” I brought the Golden home but Emerson was highly reactive toward him, so I tearfully realized I could not keep the stately old gentleman. Feeling guilty, I asked all my coworkers if they knew anyone who might want to adopt a Golden Retriever. Someone did, and Apollo went on to live a wonderful senior life. I always tease this adopter that she must have written my name on every bathroom wall in the area, because soon after I became the “go to” person for anyone with a Golden to place or wanting to adopt one. That was in 1984. In 1993, I realized it was time to incorporate and obtain non-profit certification from the IRS, so our small group made the big step. Since then, my life has revolved around rescue and I have watched with awe and pride as DVGRR grew from a grassroots “one-woman” operation into a nationally renowned rescue organization helping close to 300 dogs per year. From the very beginning, my dream had been to buy or build a freestanding kennel facility so that we could respond to dogs in need as quickly as possible and achieve the greatest level of quality care by centralizing operations. In 2000, my dream became a reality with the purchase of Golden Gateway, made possible by the generosity of everyone who contributed to our capital campaign (both financially and with the proverbial “blood, sweat, and tears”). We share our home with Goldendoodle, Reese, and a senior Goldendoodle, Cosmo. In 1990, I obtained a show quality Golden named Spencer. As I attended dog shows, I kept seeing one particular handler, a girl with hair as red as the Goldens she was showing, having a grand time in the show ring. This was Patty McCoy Coleman, Animal Control Officer for Clarks County, NY and a group winner at Westminster. I decided that I wanted Patty to handle Spencer. Little did I realize that we would not only become best friends, we would also start a small breeding program together. My Spencer and Patty’s Betsy produced several wonderful litters that made many families happy.